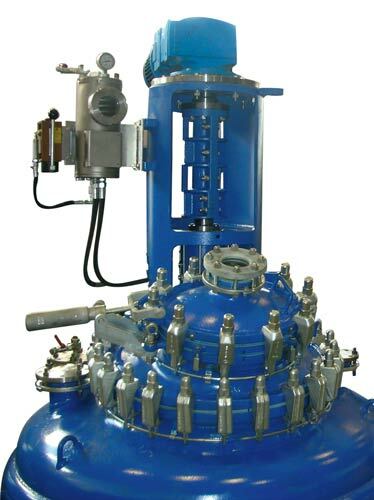 Consito small scale chlor-alkali units, 1 to 15 MTPD chlorine capacity, in order to provide for a reliable, provides highly efficient device to produce chlorine “on site”, 32% caustic soda/caustic potash and hydrogen. Our small scale plants, named CHLOR-PACK®, are pre-assembled, modular skid-mounted electrolysis units, based on bipolar membrane cells. They can be equipped with transformer-rectifier, brine prepa- ration, brine purification, depleted brine dechlorination, caustic concentration up to 50% or to flakes. Alternatively, chlorine and caustic soda can be directly converted to sodium hypochlorite (“bleach”) in a further step of our plants or to hydrochloric acid. Sodium hypochlorite, commonly known as bleach, is produced by direct reaction of chlorine gas with caustic soda solution from chlor-alkali process, to be used for water treatment, for bleaching agent in textile industry and for household products. 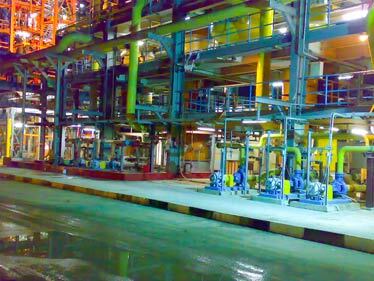 Consito developed know-how and technologies for small sodium hypochlorite units, 3.5 to 30 m3/day sodium hypochlorite solution capacity, up to approx. 160 g/l concentration and approx. 150 g/l availa- ble chlorine, in order to provide for a reliable, highly efficient device to produce “on site”. Our small plants, named HYPO-PACK, are pre-assembled, modular skid-mounted reaction units. Usually, this package is supplied together with the CHLOR-PACK® unit, in order to produce sodium hypochlorite starting from sodium chloride as raw material. Ferric Chloride or Iron (III) Chloride is used as a flocculant in sewage treatment and drinking water production. It is usually produced and marketed as a concentrated solution with a minimum concen- tration of 40% w/w. Calcium Hypochlorite is an inorganic compound, marketed as granules or tablets, used for water treatment and as bleaching agent due the very high content of available chlorine, 65-70%, greater than sodium hypochlorite. PAC is a flocculant of new concept, the specific properties of which derive from the action of its basic ac- tive constituent, namely Poly Aluminium Chloride, a polynuclear complex of polymerised hydro-aluminium ions. It is based on highly charged aluminium which results in lower dosage and therefore reduces sludge volume and pH adjustment demand. It also improves solids and/or phosphorous removal over conventional coagulants. PAC 18%: mid-basicity liquid PAC, containing 17,5 ± 0,5% alumina, specific for waste waters and neutral sizing in paper making. It is used as primary coagulant aid for any clarifying/flocculation process relating to the treatment of surface or underground water and urban or industrial effluents. PAC 30%: mid-basicity powder form, containing 30 ± 0,5% alumina. PAC 9% HB: high-basicity liquid PAC, containing 9 ± 0,5% alumina, specific for potable waters. Our high-performance PAC 9% HB (High Basicity, 60÷68%) is a formulation for treatment of drinking water, obtained by reaction of PAC 18% with aluminium sulphate, a basifier and a sequestering agent. This sequestering agent considerably improves the characteristics of the polymer, increasing the coagulation and flocculation velocity, even in case of low turbidity and low temperature. Moreover, the sequestering agent increases the storage stability of the final product. PAC 9HB produced with our technology hydrolyzes completely in treated water, forming large flakes which easily sediment, reducing the backwashing of sand filters and decanters. Our PAC 9HB releases less than 100 ppb aluminium ions with a dosage of 20 ppm in treated water, whereas standard PAC 9-10% HB leaves approx. 200 ppb aluminium ions. Sodium silicate is the generic name for a series of compounds derived from soluble sodium sili- cate glasses. They are water solutions of sodium oxide (Na2O) and silicon dioxide (SiO2) combined in various ratios, which results in solutions with differing properties that have many diversified in- dustrial applications. Standard commercial grades of liquid sodium si- licates range in weight ratio of SiO2 to Na2O from 1.6 to 3.3. Sodium silicate with weight ratio SiO2/ Na2O R=1.6÷2.5 is the base product of the silicate family. It can be marketed as dried powder or as a con- centrated solution and a solid content of about 40÷50°Bé. It is also the feedstock for producing other types of silicates. Consito developed technologies for production plants of liquid and powder sodium silicates, as well as metasilicates in granular anhydrous and pentahydrate forms. Hydrogen peroxide is a weakly acidic, colourless liquid, miscible with water in all proportions. It is the simplest peroxide and is commercially available in aqueous solution over a wide concentration range for preparation of other peroxides and as an oxidising agent mainly in pulp and paper bleaching. Our manufacturing process involves the catalysis of the reaction of hydrogen with atmospheric oxygen to give hydrogen peroxide. 2–Ethylanthraquinone is used as hydrogen carrier. Calcium Chloride is an inorganic compound, marketed as 36% solution, 75-78% flakes or 94-97% granu- les, used for roads de-icing, dust control, brine refrigeration, dehumidification, setting time reduction in concrete, petroleum oil extraction and food processing. 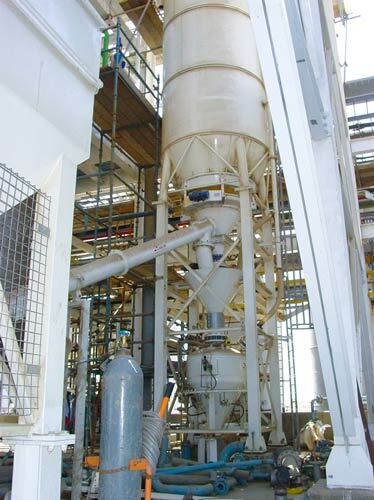 Consito developed technologies for Calcium Chloride production units as 36% solution, 75-78% flakes or 94-97% granules, basing on reaction between limestone and hydrochloric acid. For the production of 94-97% granules, Consito, in partnership with a well known European manufac- turer, developed a special fluid bed dryer with internal heat recovery, which can be fed directly with the 36% solution coming from the neutralisation, avoiding the concentration step.